“Poly-Rib” has become a household name in the field of on-site sanitation, and since we launched the product in 1982, the demand has increased almost daily – across a wide spectrum of private and commercial consumers requiring the ultimate in a maintenance-free, on-site sewage disposal system. Cylindrical ribbed with domed ends and a centre internal stabiliser bar to reinforce the domed ends against possible abnormal pressures. * The requirement of a septic tank is that it shall be so designed to retain the volumetric flow for a minimum period of 24 hours, thus should each person dispose of 150 litres per day, the tank would safely support a family of 6 people or, should the disposal be 100 litres per person per day, the tank would support 10 persons, and so forth. 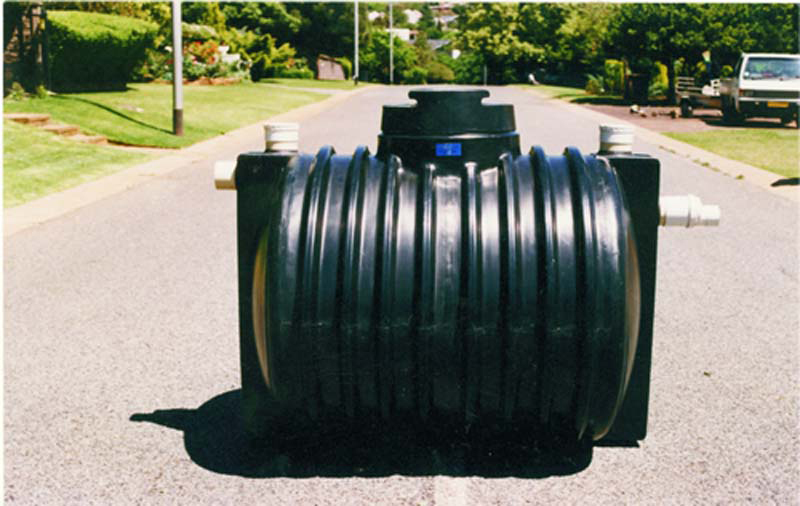 The double-chamber ribbed septic tank, manufactured from rotationally moulded polyethylene, is revolutionary and will withstand outer pressures in excess of any other form of similar product. The excavation for the tank does not need to be refined, and the same applies to the back-fill after placing the tank into the excavation. We recommend that the tank be filled with water during back-filling of the excavation. The excavation dimensions are length 2,0m, width 1,8m and depth (variable) minimum 1,2m. The ribbed walls eliminate the necessity for a heavily constructed concrete slab being placed over the top of the tank. The 450mm diameter manhole allows easy access to workers if the system is poisoned and needs to be cleaned. Click here for more information on The “Poly-Rib” Septic Tank.